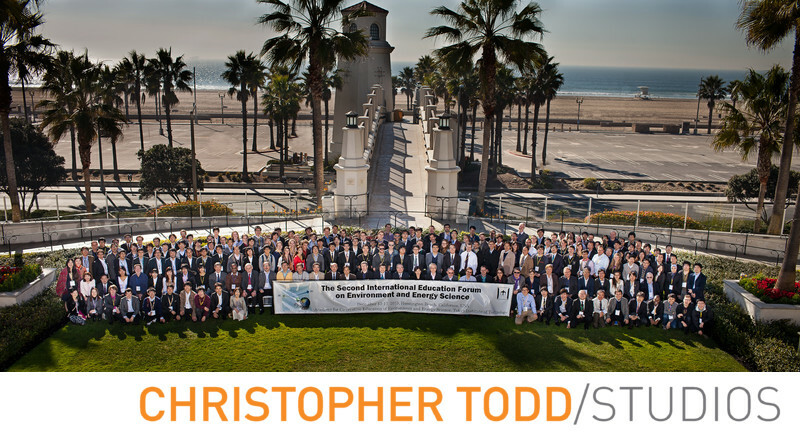 This group photo of a large corporate event was taken out on the terrace at Hyatt Regency Huntington Beach. We were able to capture everyone with the tower and bridge to the beach in the background. You can see it was a gorgeaos sunny day in Huntington. I love the palm trees and the blue ocean in this picture. It can be a challenge photographing large groups but with the right camera equipment and some organization it is possible. These photos are great for companies to use on their websites, social media, and brochures. 1/320; f/7.1; ISO 100; 35.0 mm.